Uluru-Kata Tjuta National Park has to be one of the most naturally beautiful places we have ever been. Just the colours of the park alone were unlike anything we had ever seen before, with bright red sand, almost white grass and dark green trees surrounding the base of the infamous orange rock as well as the fields as far as the eye can see. But there is actually so much more to Uluru and Ayers Rock than just visiting the rock itself. From cultural experiences, artistic workshops, exquisite dining experiences and once in a lifetime evenings, there is something for everyone! Here are 10 of the best experiences at Uluru that you should absolutely add to your bucket list. 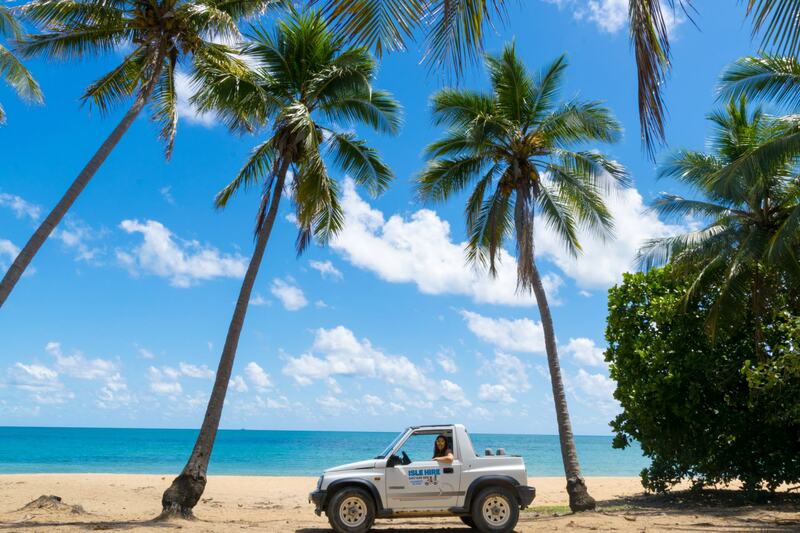 There’s not much better than the sun peaking over the horizon and lighting up this beautiful part of Australia. 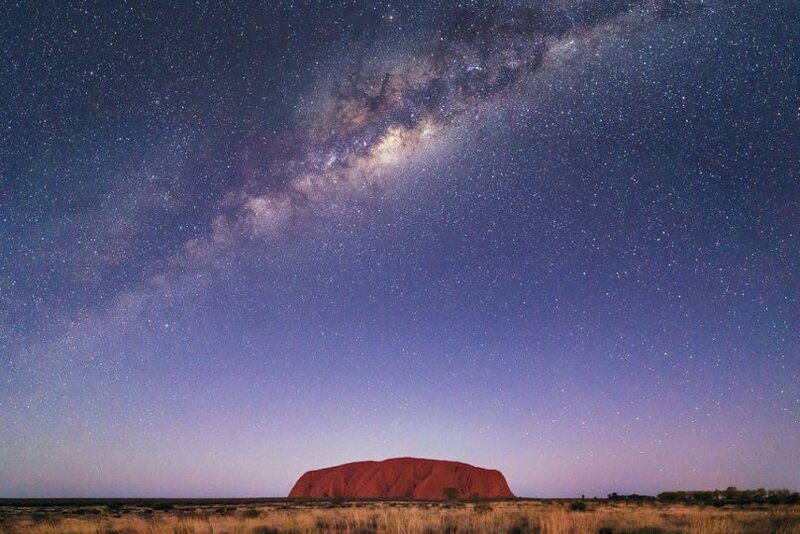 Due to the desert location of Uluru there are clear skies most of the time, offering a stunning sunrise as the world begins to light up for the day. We found that the early mornings were our favourite time of the day – Uluru-Kata Tjuta National Park was slowly starting to come alive and the colours of the park were just incredible. The grass seemed almost completely white, with Uluru and the surrounding trees standing out in vibrant colour. It is absolutely worth the very early wake up time! Follow the signs that say “Talinguru Nyakunytjaku” to get to the sunrise viewing platform. 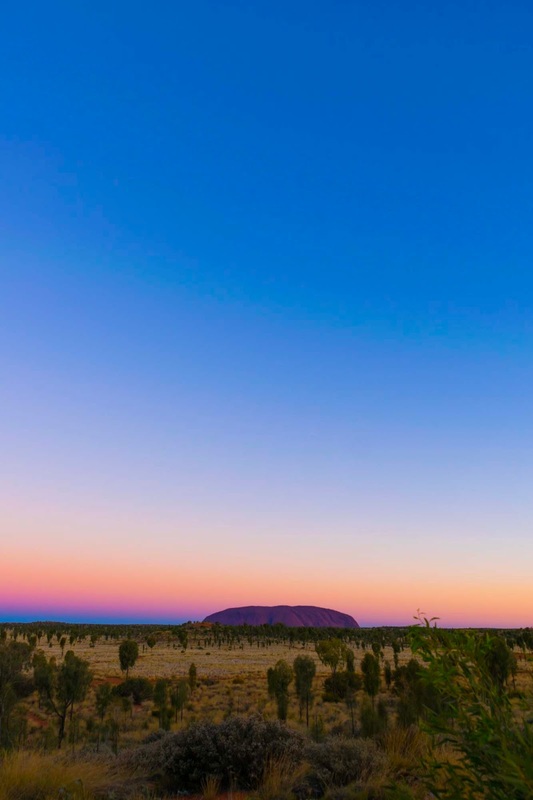 Hot tip: The sunrise and sunset platforms are positioned so that visitors can experience the beautiful changing colours of Uluru as the sun rises or sets. If you would like to see the sun actually rising or setting over Uluru, head to the opposite platform – i.e., the sunset platform at sunrise. Not only do you get to see the sun coming up over the rock, but you will also have the viewing platform almost all to yourself. There is an ongoing debate about whether Kata Tjuta (also known as The Olgas) is even more impressive than the main attraction of Uluru. While we will let you decide about that for yourself, we can tell you that Kata Tjuta does hold some seriously impressive statistics. 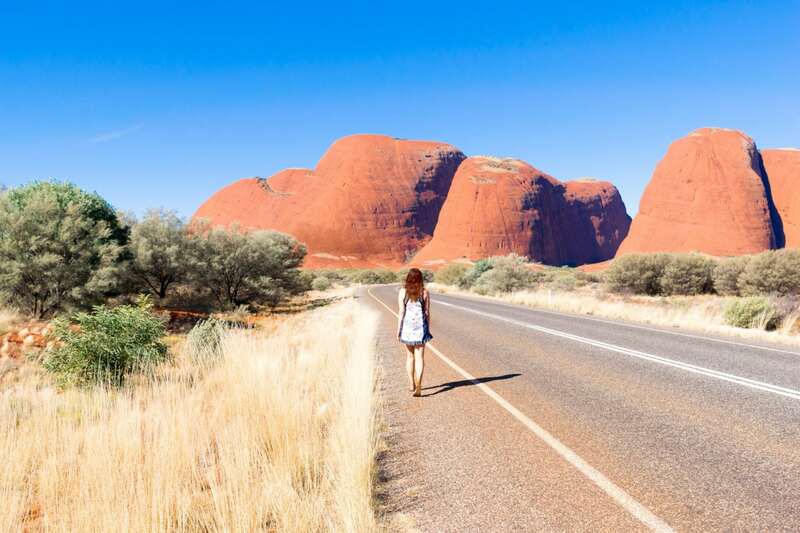 The entirety of Kata Tjuta consists of 36 domes, with the highest rising 546 metres above the land – 198 higher than Uluru! Kata Tjuta is absolutely worth the journey (it’s about half an hour further into the park than Uluru), it’s incredible. Hot tip: The only bathroom facilities around Kata Tjuta can be found at the Kata Tjuta Sunset Viewing area. 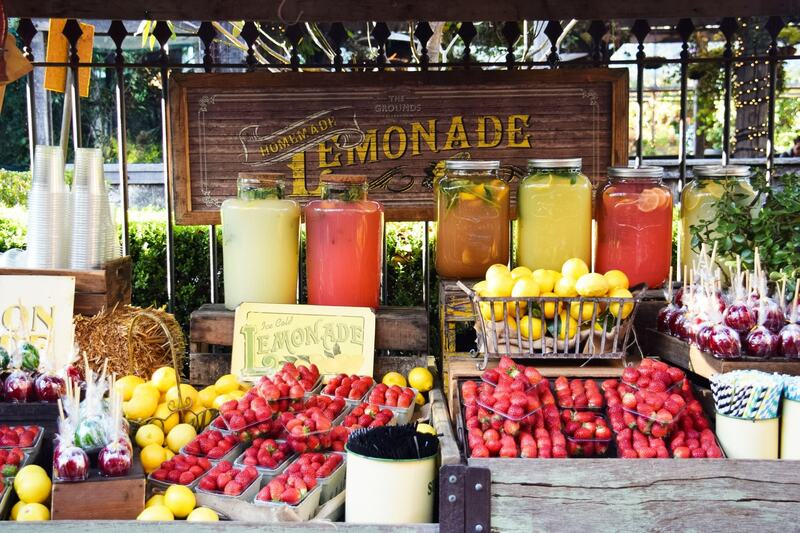 Make sure you stop by before taking a hike to prevent getting stuck later! Another unique way to explore the vast desert of Central Australia is from the back of a camel. Camels actually used to be the main outback transport until railways and roads were developed in Central Aus, so it’s kind of like a step back into the old desert days! There are a few different ways to experience a camel ride at Uluru with Uluru Camel Tours. Uluru Camel Tours is the largest camel farm in Australia and is home to 60 camels! 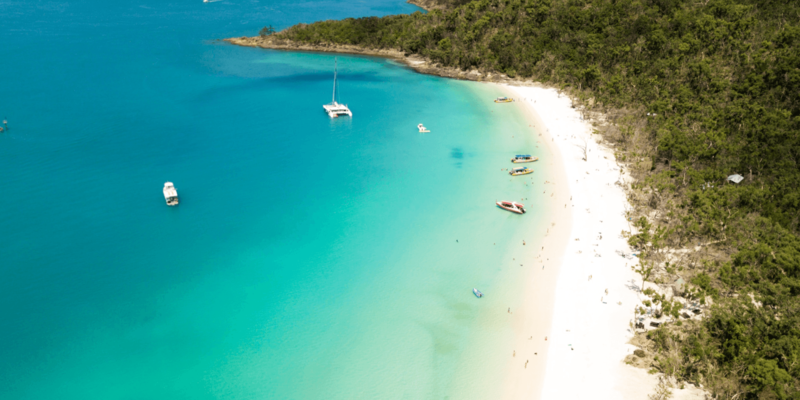 You can choose to either have an express camel experience in the morning or afternoon (10:30am or 2pm) for $80 AUD per person – which takes you on a 45 minute ride through the desert and to the secluded sand dune lookout. For an even more memorable experience you can take a sunrise or sunset camel experience (leaving one hour before sunrise or sunset) for $129 AUD which takes about an hour. Hot tip: Visitors staying at Ayers Rock Resort are offered a discount with Uluru Camel Tours. Make sure you check it out with your hotel reception before booking. The Field of Light is a global phenomenon and a truly remarkable art instillation by internationally acclaimed artist Bruce Munro. Originally only intended to be on display for one year, it was extended for a second (until March 31st, 2018) due to insane popularity. 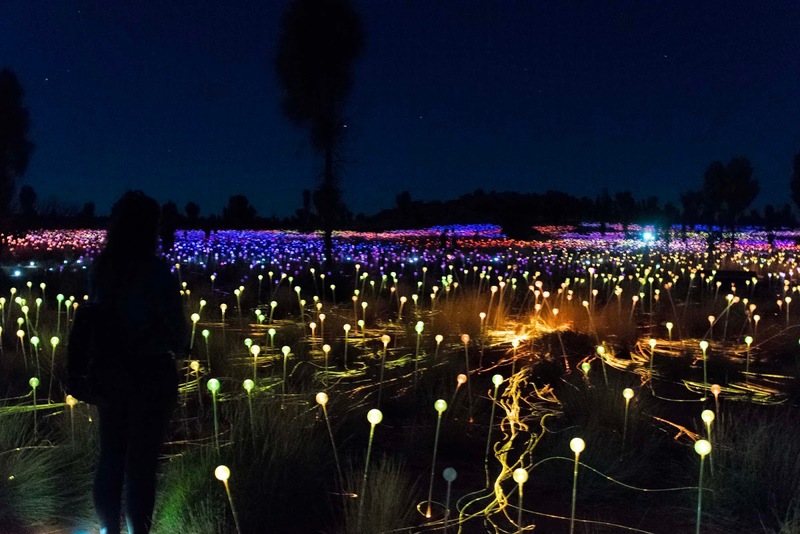 The exhibition is named Tili Wiru Tjuta Nyakutjaku which means ‘looking at lots of beautiful lights’ in the local Pitjantjatjara and is Munro’s largest piece to date, with more than 50,000 slim stems sprawled across the outback field. Hot tip:Even though the Field of Light is in it’s second year it is still gaining more and more popularity and is booking out faster than ever! Make sure you check your dates and book your tours in advance so you don’t miss out on your dates. Tickets start from $39 AUD per adult for the Field of Light Departure 1, 2 or 3 (leaving at different times across the evening) or $85 for the Star Pass, $189 for the Star Pass by Camel or up to $615 for A Night at Field of Light by Helicopter. Visit the Field of Light website HERE for all packages and options. If you’re looking for a once in a lifetime opportunity, this is it! 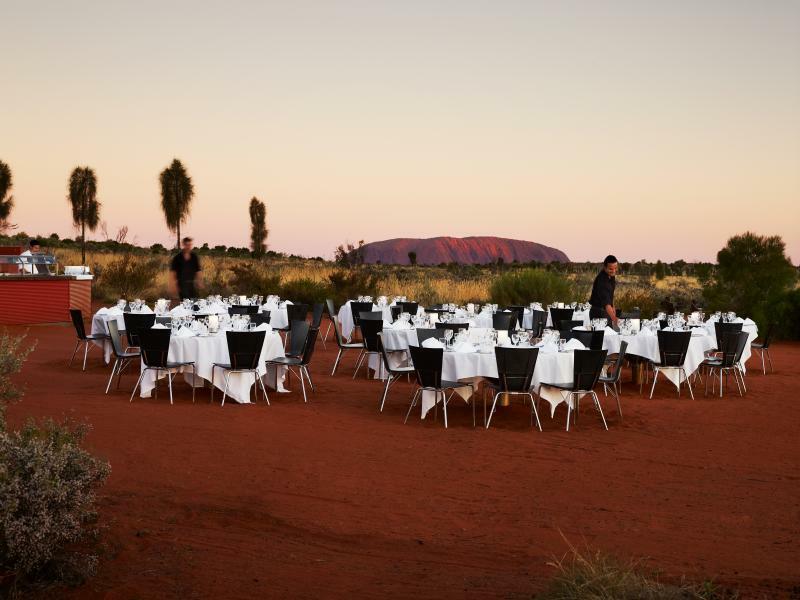 The Sounds of Silence Dinner offers an evening of dining under the stars of the Outback, with Uluru watching over you in the background. 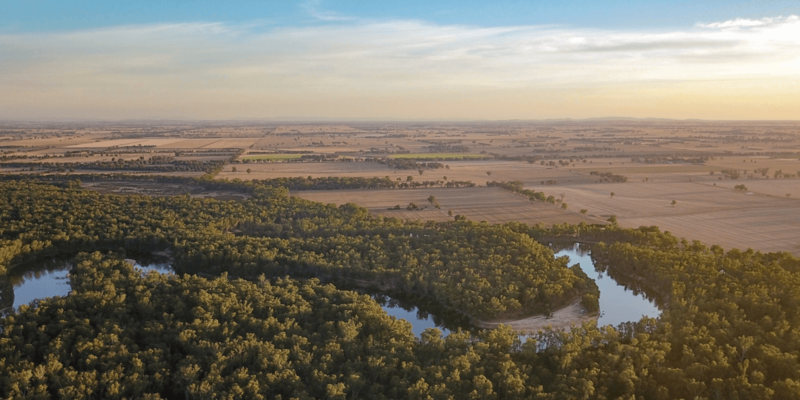 This three course extravaganza in the Red Desert serves up the best Australian wine and beer, as well as a bush tucker inspired menu including grilled barramundi, wild kangaroo fillet and house-smoked crocodile. There’s even a didgeridoo performance and a guided tour of the night sky! Hot tip: If just one magical experience isn’t enough, you can upgrade your Sounds of Silence dinner to “A Night at Field of Light”, combining your dinner with the Field of Light Experience. The Sounds of Silence dinner starts from $199 per adult, or $245 for A Night at Field of Light. Find out more information HERE. 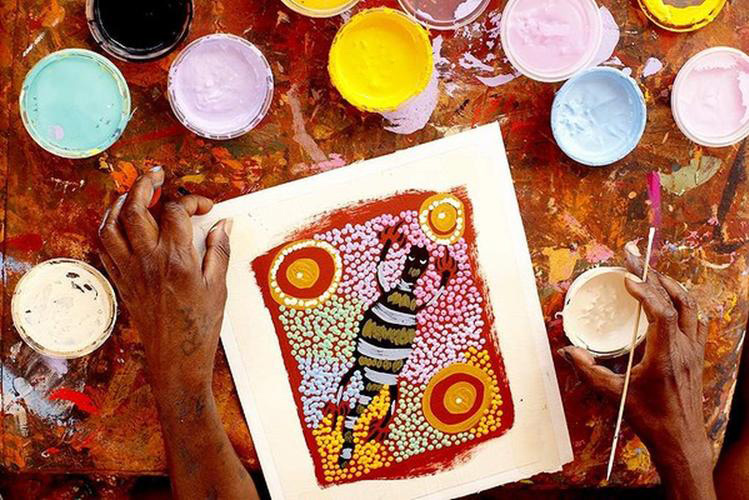 If you’re interested learning about local Indigenous Art, the dot painting workshop offered by Ayers Rock Resort is for you. Anangu paintings are created for educational and ceremonial purposes, as well as a way of telling stories of events that have occurred. Join the workshop to learn about the different symbols depicting the Creation Time stories (Tjukurpa) and have a go at your own dot painting. Hot tip: After your tour, pay a visit to the next door Indigenous Arts Markets to see local artists at work and purchase an authentic piece of Anangu art or craft to take home and remember your trip. Dot painting workshops are $69 AUD per adult or $35 AUD per child, and are held twice per day – once in the morning (between 11:30 and 1pm April – September and 10:30am – 12pm October to March) and once in the afternoon (2pm – 3:30pm April to September and 1:30pm to 3pm October to March). The most physical way to experience Uluru is to walk the entire way around it. 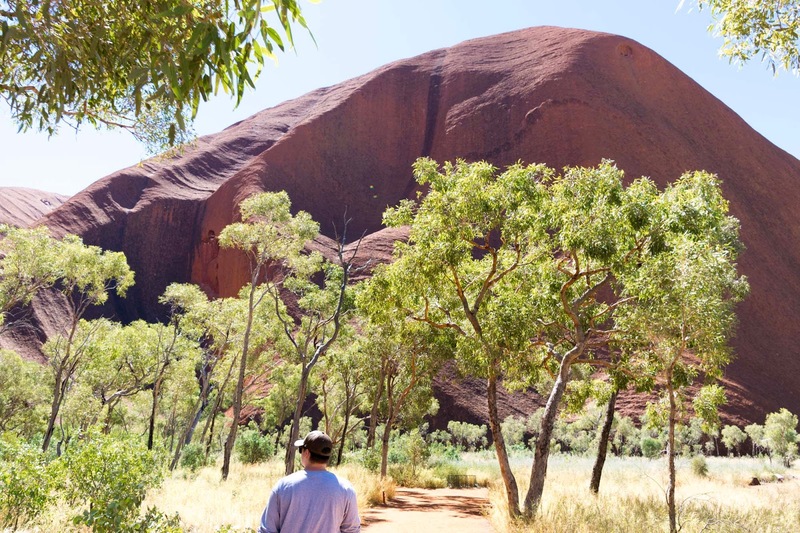 A walking path circles around the rock that stretches out for 10.6 kilometres (or over 11 kilometres if you take a detour to the Mutitjulu Waterhole) that can be either walked, cycled or even experienced by segway if you wanted to book a tour! In the summer months and extreme heat it is recommended that you finish the base walk before 11am to avoid heat exhaustion and dehydration. Make sure you wear sunscreen and a hat for your walk and take enough drinking water to last the whole way. Very little of the walking path is shaded, with no facilities available (toilets, water or even a bench to sit down), so be prepared. A remote location with very little artificial light are some of the best conditions to experience the night sky and the wide galaxy of stars that lives above us. Although you’re not allowed to camp or stay in Uluru-Kata Tjuta National Park overnight there are still plenty of places where you can experience and photograph the insane night sky of the Outback. It’s a good idea to try the Uluru lookouts within Ayers Rock Resort, parking just outside the national park or exploring along the dirt tracks of the last free camping site (if you have a 4×4) to find some of the best places for night time photography. Hot tip: Check out this Astronomy Guide to figure out and understand exactly what’s what in the night sky and when you can find some of the most important and impressive stat constellations. To learn more about some of the creatures of the Outback, make sure you check out the Red Desert Reptiles Show. 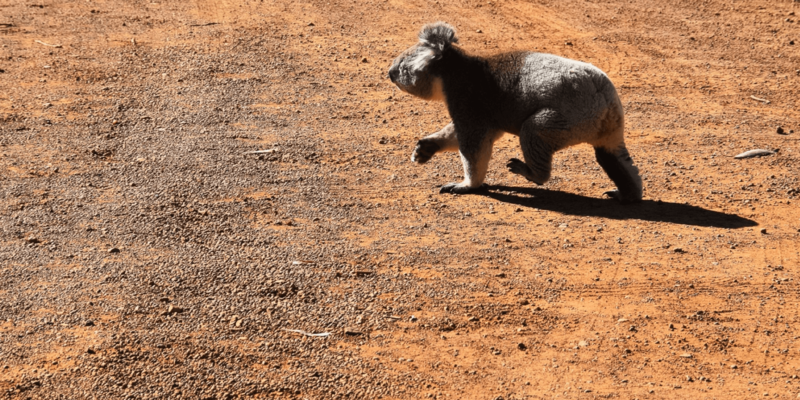 You’ll meet Bruce the blue tongue lizard (lungkata), Wolverine the bearded dragon (ngapala), Max the Mula – also known as a king brown (liru) and a Woma Python (kunlya) – just a small introduction to some of the 73 reptile species that call the Outback their home. You can get up close, touch and even hold some of these reptiles that you might not experience anywhere else in the world. Hot tip: Many of these creatures have learnt to adapt in this harsh environment and have the ability to camouflage and rapidly change colour, so it’s unlikely you’ll see them out in the wild. This might be the best way to experience some of these unique creatures! The Red Desert Reptiles Show costs just $25 AUD per adult or $15 AUD per child with a morning show at 10am and an afternoon show at 2pm. 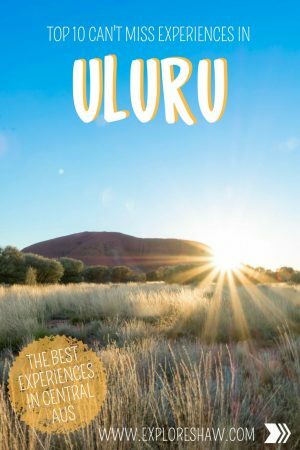 An absolute must and one of the best ways to experience Uluru. As the sun sets over the great rock the colours of the sandstone changes until it’s surrounded by darkness and the stars of the night sky. Get to the viewing platforms at least an hour or so before the sunset to make sure you get a good parking spot and to see the biggest colour changes over the beautiful rock. Hot tip: For the ultimate sunset, why not visit the sunrise viewing platform. 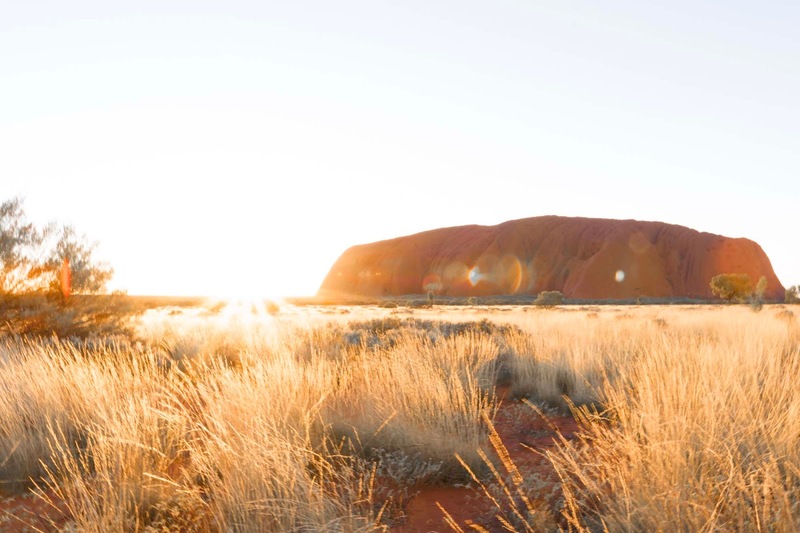 Not only do you get to watch the sun actually setting over Uluru, but it sets directly in between Uluru and Kata Tjuta! It’s the perfect place for the ultimate sunset picture. Amazing! I love your photos! Look like such a stunning experience! The whole trip is beautiful in a surreal way. Love your hot tips! But I really can't get over that little reptile!! Wow! 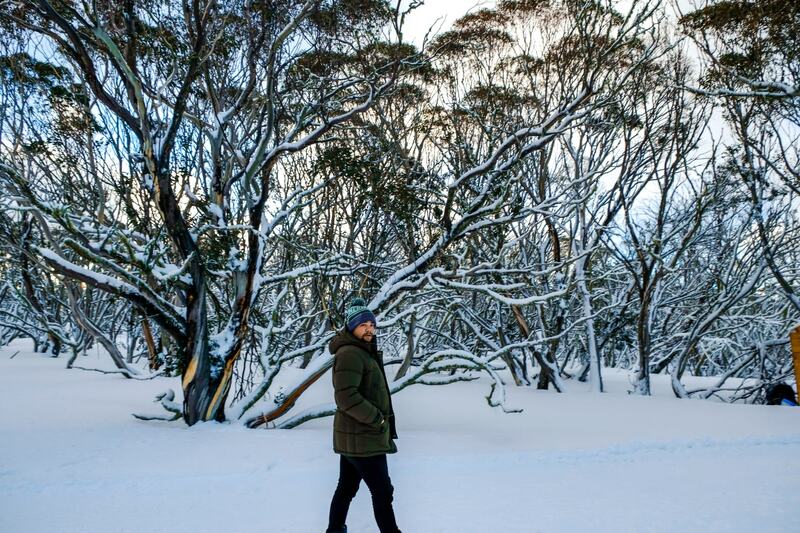 These pictures are amazing, it looks like you had an amazing time! I love that lizard! This was so much fun to read! I used to teach high school World Geography and the students always LOVED the Australia unit. They leaned about Uluru, and I had a video clip about the devil lizard. This is on my bucket list! I've only been to Australia one a few years ago but I've been dying to go back – Uluru's on my list! These tips are awesome. Thanks for sharing! !